What is the real Russian potential to reduce emissions of greenhouse gases? According to the study "Energy effective Russia”, the country is capable of much greater reductions in greenhouse gas emissions than the commitments stated by Russian officials. 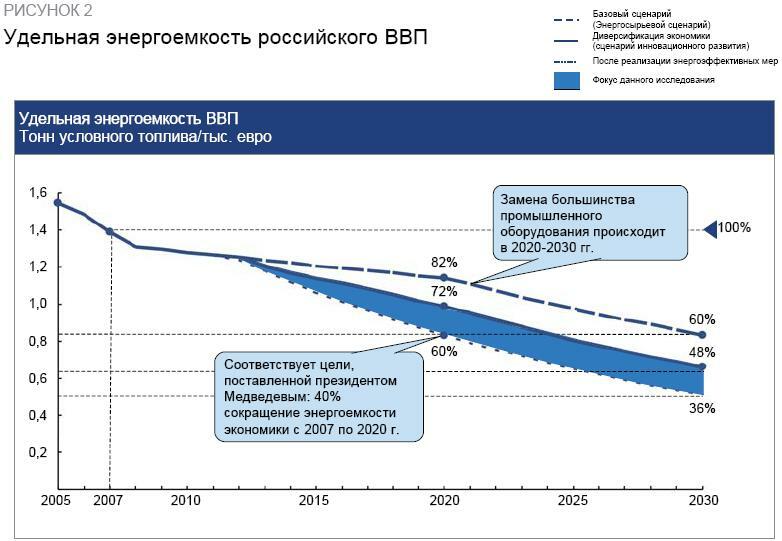 The present goal for energy effectiveness in Russia is a 40% reduction from the 2007 level. This figure was announced in June 2008 when President Medvedev signed a decree "On some measures to improve energy and environmental efficiency of Russia's economy”. Russian commitment to reduce green house gases emissions is 25% from the 1990 level by 2020. This goal was pronounced by Russian President Medvedev at the climate conference in Copenhagen. The McKinsey study, which is based on consultations with more than 50 experts, including Russia's leading specialists, comes to the conclusion that greenhouse gas emissions in Russia might be reduced by -42% from 1990 levels for 2020, and -54% for 2030. Implementation of the measures which are cost-effective today, might lead to reduction -31% in 2020 and -27% in 2030. This is still more ambitious than the official Russian goals. The study finds that reduction the energy cost of Russia's GDP might reach the -40% level from 2007 declared by Medvedev by 2020, and by the year 2030 GDP energy cost reduction might reach -64%. This dramatic reduction can be achieved by replacing old industrial capacities between the years 2020-2030. The study reads, "Without risk for the rapid economic growth, Russia may additionally implement a number of measures to improve energy efficiency and reduce greenhouse gas emissions. A program of energy efficiency measures might save energy consumption in Russia at the current level, while economic growth increases twice. By 2030, the annual savings of energy can reach volumes comparable to a annual energy consumption in Canada today." Among the main measures to improve energy efficiency and reduce emissions of greenhouse gases the study lists measures to improve thermal insulation of residential and nonresidential real estate, as well as installation of heat meters and thermostats, upgrade of insulation of heating systems, improvments in maintenance of pipelines. The study also lists measures in industry, energy and transport sectors, and in waste recycling. 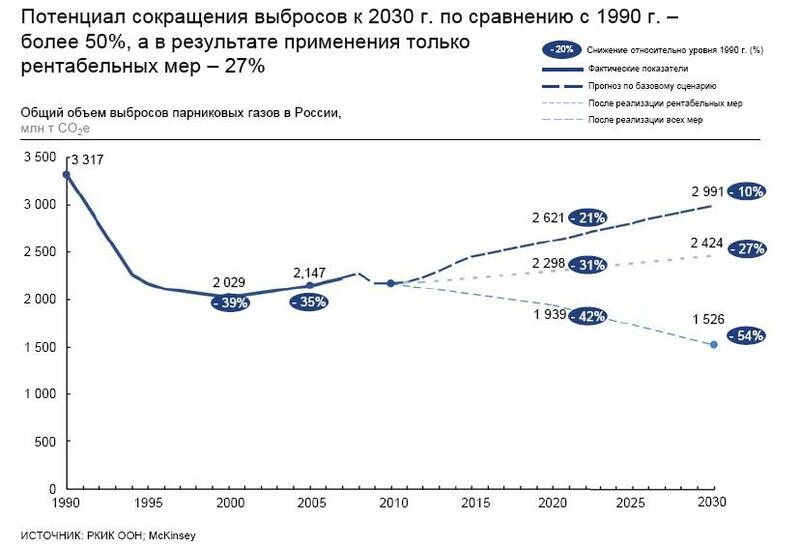 Russian Socio-Ecological Union considers that by 2020 Russia might keep emissions of greenhouse gases at pre-crisis level of 2007 (-35% reduction from the 1990 level, without taking into account absorption by forests) and take action to keep greenhouse gases emissions reduction at -80% level from 1990 by 2050.